Earlier today we stopped off at Rock Island to look for a Western Grebe. We are driving out to Colorado for a ski racing camp, and I wasn't going to let up a state nemesis go by. We pulled off at about 11:00 and got to the river front shortly afterword. We scanned the North side of a riverboat, but no luck. I walked down to the other side of the riverboat, and immediately found it floating about 250 yards out. We took some photos and then turned around and headed back upstream in our car to find a Lesser-black Backed Gull. The Lesser-black Backed Gull wasn't in sight, so I scoped even farther out and found him about 1000 yards out sitting on a long log with about ten Herring Gulls, a good November bird! We made a quick porta-pottie stop and right before we left, a group of about 100 Mallards flew in. Within the group was one Wood Duck that looked pretty darn confused. Lesser Black-backed Gull1 Seen on usual log, bright yellow legs and dark back. We started the day off at rainbow beach with 13 people The first 30 minutes were spent looking by the parking lot there was not much there other than a hundred Coots, Red-breasted Mergansers and Horned Grebes. After that we started to hike in the grasses to if there was anything hiding in the Coots and flushed a song sparrow. Once we got the best viewing spot of the coots we saw a few hundred ducks that were directly in the sun. We started to head back to our cars to try to get to the other side of ducks along the way we flushed a swamp sparrow and saw a very cooperative SNOW BUNTING on the beach. Once we got the other side of the ducks we saw Redhead, Bufflehead, two SURF SCOTERS found by me, Greater Scaup, Mallard, Common Goldeneye, Red-breasted Megansers, Horned Grebe, and Canada Geese. Then we went to calumet park and saw a few hundred Canada Geese in the baseball diamond and a raft of Coots in Indiana not much else there. after that we drove Steelworkers Park along the way we found about 50 MONK PARAKEETS at 88th St.
After stopping there for a while we went up to steelworkers park and found that was very quiet with the best bird there being a Kestrel. This post was written by Oliver Burros. Today we went to Montrose Point to look for Snow Buntings and any migrating ducks. We arrived there at about 8:15, and immediately headed down to the dunes. Since the winds were in the 20's and straight out of the North, there was zero activity in the hedge, so we moved on. Once we got to the beach, I started scanning. There was nothing I could see until a flock of 50 MALLARDS flew by. Then a birder came and told us of four SNOW BUNTINGS up the beach a little ways. We actually didn't need to walk, the buntings came to us! along with a MERLIN that zipped in and quickly left. This small unidentified duck/scoter/gull came by. I'm still not sure on what it is, so if you know let me know. We had to leave after that. It was a great November day. I got 1 1/2 Illinois Lifers, so it wasn't bad at all. Lists for Montrose is below. It was my Grandma's last day in town, so I decided to go birding with her. There had been reports of a Hooded Warbler downtown at Millennium Park. So we headed down there to check it out. Once we got to Millennium, there were lots of White-throated Sparrows and White-crowned Sparrows. Mixed in with them were a few birds such as Ovenbirds, Hermit Thrush, and a Swainson's Thrush. We continued on slowly towards the Bean spotting a few birds such as Nashville Warblers, one Blackburnian Warbler, and two Yellow Warblers. The sun was pretty high and the birds had quieted down, so we decided to go to Montrose Point Bird Sanctuary. About 15 minutes later, we arrived at Montrose, and to our delight, there was apparently a White-eyed Vireo, and a Blue-winged warbler in the Hedge. We continued on, and after a short distance, we saw a group of birders with cameras up. I happily I picked up my pace. Once arrived, the birders directed me to a White-eyed Vireo, perched in a tree. In the next tree over there were to Blue-winged Warblers showing off pretty close, so there were some pretty good photo opportunities. The birding was not bad for mid-day birding in early May. While photographing the Blue-winged Warbler, I heard what sounded to be a Blackburnian Warbler. I hadn't seen one this year, (but I've heard them), so I figured I'd better try to get an eye on it. The bird was nonstop singing so it didn't take that long to find. It was a duller adult male bird, singing about 30 feet up in a tree. The bird gave us pretty nice looks before we moved on. A very coaperative Brown Thrasher gave us some nice looks along with a Black-and-white Warbler. Then we headed back to our car, having to drop my grandma off at the in airport in thirty minutes. We then headed home. List of birds from both location below. Today I went in pursuit of a Western Tanager and a Swainson's Warbler. My friend Jake had let me know at around 3:40, about 15 minutes after my Mom and Dad arrived from vacation, (I couldn't go birding in the city because my mom was concerned and my grandma didn't want to drive down there, which I totally understand.) So we left, my dad, my brother Brett, my friend Nathan, and I. We were driving to see a bird called a Western Tanager. After driving for some time, we arrived and the lady took us to her backyard where we waited for about a half hour. There were multiple White-throated and White-crowned Sparrows in the backyard, then some orioles came in and left. After about five more minutes, Nathan said that there was a bird that looked like a yellow oriole? So I ran over to him and looked, there it was, a beautiful adult male Western Tanager, perched on the branch of an oak. We watched it for a few seconds, photographing it between a screen, then it flew down to the orange feeder, and that is where it really showed off. The pictures aren't to great because if we moved, the bird would fly away. Shortly after, we said thank you to the owners who were very nice to us, and headed on to try and find the Swainson's Warbler at LaBagh Woods. When we got there, a few birders immediately notified us that the bird had not been seen for about two and a half hours. Not a good sign. So a little disappointed, we headed up the small hill to the path, where we were met by some birders. They had told us that there were at least two blue-winged Warblers in the area, but no Swainson's. We headed threw the brush and found a beautiful male Blackburnian Warbler, very low in a tree. About a minute later, a Black-and-white Warbler came out and climbed up and down a tree, giving Nathan his first looks at this stunning tree climber. While we were still looking for more warblers, Nathan wandered off into the brush. After a few minutes i heard him say, "I think there is a Kentucky Warbler" (he had seen one two years ago with us at Swallow Cliff in the Palos area.) I slowly walk towards him, and on the ground in front of us was and adult male Blue-winged Warbler! Once the bird saw three cameras go up to photograph it, it looked at us, and flew about five feet further into the more dense thickets. We headed back up onto the main trail were we got half decent looks at the bird again, before it vanished. After sorting threw lots more White-throated Sparrows, we turned up a few more Northern Waterthrushes, but that was all. Disappointed about missing the Swainson's Warbler, but happy about finding the Western Tanager and all of the other warblers, we headed back to the car. My mom had called us and we had to leave. But it was a great day! Bird list for LaBagh below. The list for the other location will be out soon! Yesterday, my brother and I met up with our friends and fellow birders from San Francisco. Jonah, Max and their dad, joined us to venture to a place very close to my house, called Salt Creek Forest Preserve. We started on the east side of the woods and birded our way in. Since Jonah and Max were from San Francisco, they had a few birds they had never seen before, and their target birds were Rusty Blackbirds and Red-headed Woodpeckers. We started walking on a small trail towards a small swamp. I asked Jonah if we could step off the trail because I had a feeling there were some blackbirds on the other side of the marsh, and there were! On the other side of the swamp we at first just saw Red-winged Blackbirds, but then another blackbird flew into a nearby pool. It caught our eyes because it was completely black with no red on the wing, and it had a yellow eye. It was a Rusty Blackbird, a life bird for Jonah and Max! After some celebrating. We headed back to the trail and kept on walking. The birdlife was crazy, (but not very diverse) with hundreds of robins, flickers, both kinglets, and lots of Red-bellied Woodpeckers. Once we got to the open meadow/grassland, we headed along the edge of the forest to look for Red-headed Woodpeckers, because that was now their main target. After some intense walking we came to the bike trail, and kept walking on it. Immediately after we hopped on the trail we came upon a small pond, where 10 Wood Ducks were feeding. Almost instantly they flew off into some trees about 100 yards away. At that point, we decided to step off the path because it didn't look very bright ahead for Red-headed Woodpeckers. We took a small path back into the forest and kept on it, until it hit a fork. It was around 5:00 by that time, and we still needed to eat before we went to see the woodcocks. Then my brother Brett heard something. We started walking really fast toward that direction and there they were! Three Red-headed Woodpeckers! Another lifer for Jonah and Max! After celabrating on lifer number two for the day, we started back to the car, but before we could get there, a falcon/accipiter flew over. Jonah immedietly identified it as a Sharp-shinned Hawk. After stopping to get more pics of Rusty blackbirds, we continued to the car and headed to a brewery for dinner. After dinner we headed to Mayslake Forest Preserve to look for Great-horned Owls and American Woodcocks. Upon arrival we saw many Song Sparrows, Red-winged Blackbirds, Geese, American Goldfinches, and Tree Swallows. We waited a few minutes and Jonah wandered off in search of the owl. I was going to stay behind with my brother and Max to wait for the Woodcocks. After about ten minutes of goofing around, Jonah came back with a pretty nice photo of the Great-horned Owl. Then we heard the first peeeent and saw the woodcock fly in over our heads. we slowly crept in that direction until we where within twenty feet of where it landed. Then I saw the woodcock all hunkered down to the ground feeding on worms. We got the flashlight on it and we all saw the little patch of brown. Jonah was the only one who got a photo of it. After getting everyone on it, the woodcock flew to its nightly display patch and drifted off into the grass. We heard it a few more times and then no more. After some more searching we finally had to go back to the train station and drop them off for their ride back to Chicago. I had a great time birding with them and I hope to see them again soon! Welcome to my very first blog post on my new website. My name is Eddie Kasper and I'm a young birder from Western Springs, IL a western suburb of Chicago. I have been birding since I was seven years old, but my interest in birding started a year earlier at a Waldorf school. In the Waldorf school curriculum, the first six years of school you spend almost an hour and a half each day outside, and the schools property was over 5 acres of forest, grassland, and a sledding bowl. The variety of birds was pretty good considering that I was a six year old birder who thought that Cedar Waxwings were a mega rarity, but every birder has got to start somewhere! After that I picked up my first bird book, Kenn Kaufman's Guide to Birds of North America, which you can buy here at http://www.kaufmanfieldguides.com/. He has been an inspiration ever since. My first few years of birding were on my own. My parents and I did not know there was a whole world of unique individuals, young and old, who enjoyed birding, until one day I met Jeff Reiter. He leads bird walks at a place called Cantigny, in Warrenville, Illinois. He shared with me information about the Illinois Young Birders club. I was really exited to know that there were other young birders in this world, other than me. I signed up immediately and went on my first field trip a couple of months later, to a place called Starved Rock, in Central Illinois. After that trip, I knew birding was my thing. I went on practically every young birders' trip after that! Only about a month after that trip to Starved Rock, my mom took us out of school, and I began to homeschool. Ever since then, I've been birding every single day I can. In spring and fall, my personal favorite birding location is probably Montrose Point Bird Sanctuary, in Chicago. According to my eBird checklists, I have seen 151 different species of birds there (I've probably seen more). I also bird my own neighborhood. 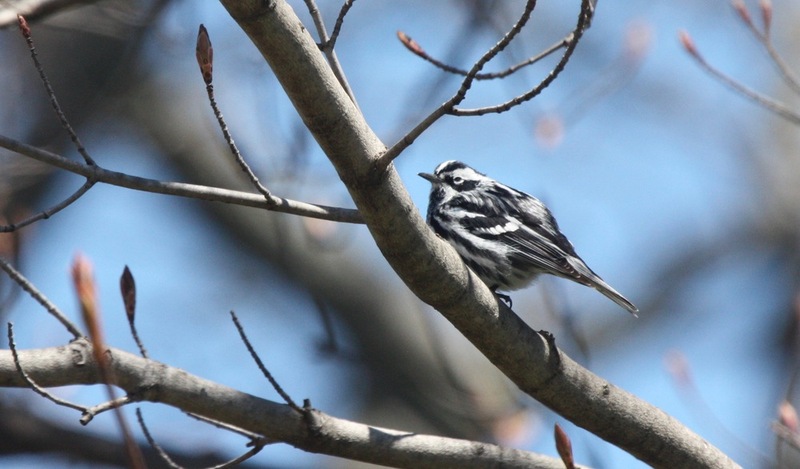 I have seen everything from two Red Crossbills, to Whooping Cranes flying over (that my brother spotted), to multiple Connecticut Warblers. But trust me, the reason I've seen some of those birds is because it doesn't matter where I am, or what I'm doing, I'm always looking and listening for birds (even while playing sports.) For example, when I found the Red Crossbill, I was biking to my chemistry class at my friends house, and I heard at least two birds calling on my right. I stopped and looked over into a Red Cedar in one of the neighbors yards, and I saw the two birds, only for a brief moment, then they flew off and called again, reassuring me that they were Crossbills. That's just to show you, you can see a bird anywhere. I hope you enjoy my website and blog! Stay tuned for more posts from me, the Kidbirder.